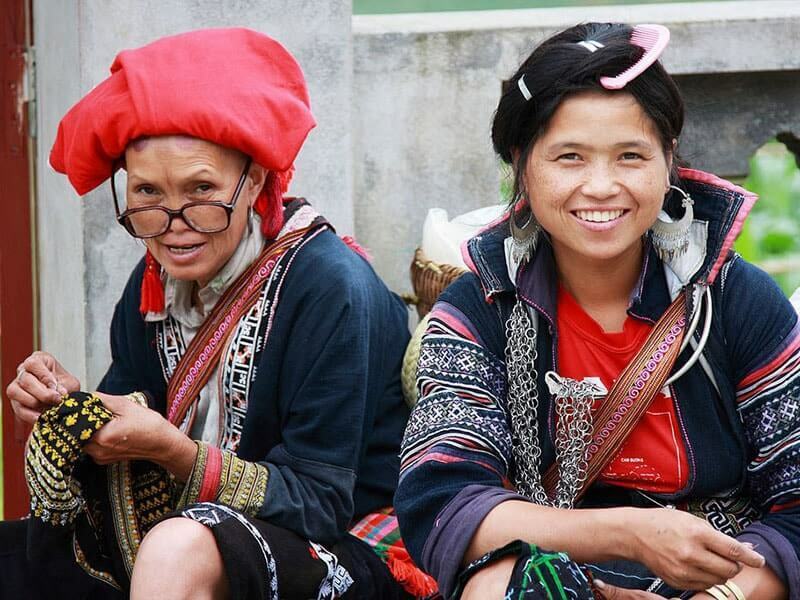 For those who enjoy venturing off the beaten track and want to be immersed in the hill tribe culture of Northwest Vietnam then this Vietnam custom tailored tour is the perfect one. Start in Hanoi, you then journey high into the Tonkinese Alps, with the unique traditions of minority tribes within the mountains near the Chinese border, textured with unparalleled paddy fields creating terraces up the foothills. 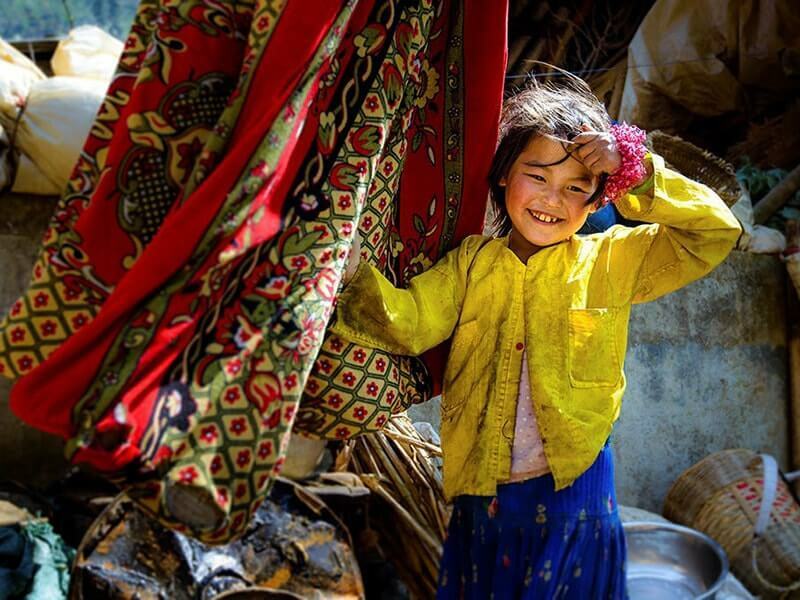 The region is awash with colourful ethnic minorities and bustling markets. Long drives and simple accommodation are rewarded with stunning views and a chance to experience undiscovered Vietnam in the more remote mountain villages. 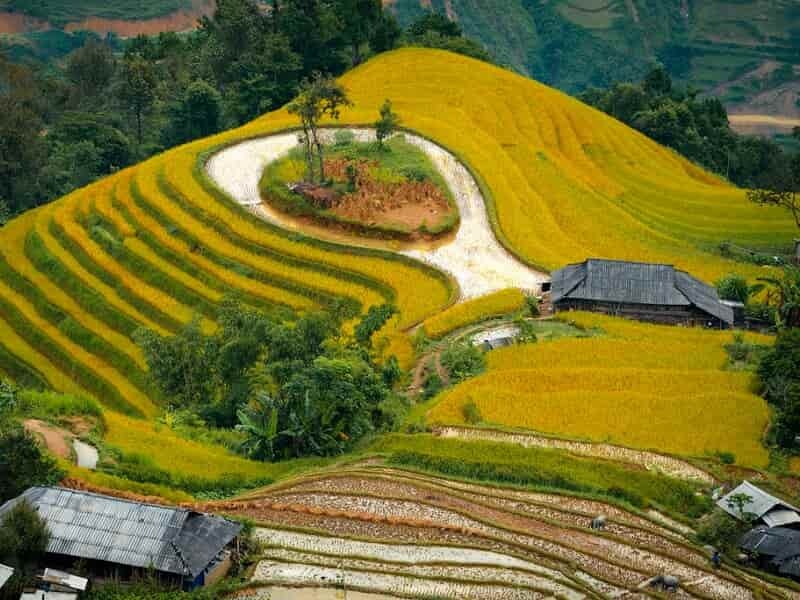 Return to Hanoi by train and continue by road to Mai Chau where you will see ethnic tribes wear colorful textiles displaying intricate patterns. Welcome to beautiful city of HANOI, an eclectic mixture of the present world that encompasses its history like a proud badge of honor. Upon arrival, you will be met by your guide and driver then transported to your hotel for check in. Depend on your actual arrival time, some soft sightseeing for an orientation tour is suggested. For some activities in the evening, follow your guide for a culinary adventure while tasting street food in the Old Quarter. It’s a great chance to sample all those weird and wonderful foods you see but just aren’t sure what they are! Stroll through the narrow streets of the old quarter as your guide points out a range of tasty noodles, snacks and breads. At night the sidewalks are packed with locals perched on stools, amongst bubbling pots and sizzling woks. These small pop up restaurants are a nightly feature that all but disappear during the day. Sit down and enjoy a flame-grilled Vietnamese barbecue of beef, chicken, vegetables and tofu on skewers. The night comes to an end with dessert from Hanoi’s best-known ice-cream parlour before returning back to your hotel. 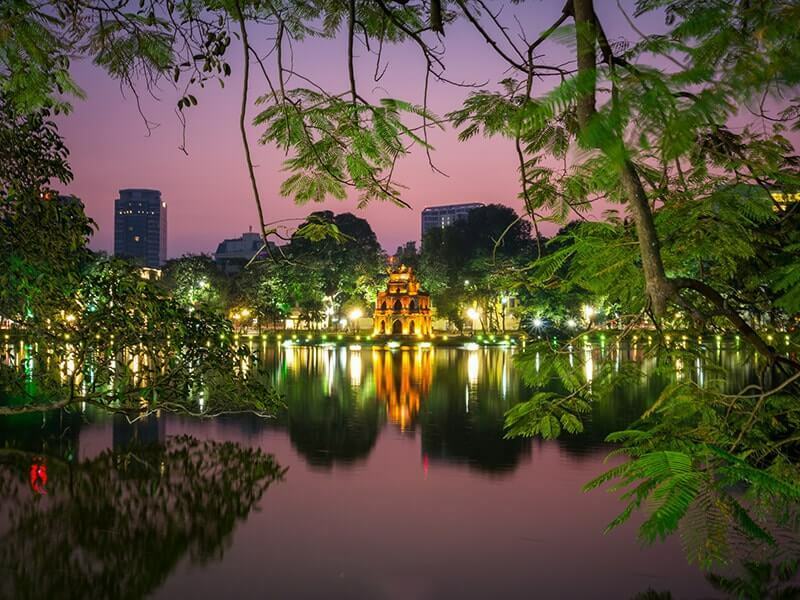 After a refreshing night’s sleep, begin your journey this morning encompassing some of the highlights and hidden gems of Hanoi. The city showcases superb French architecture from its colonial days, with large tree-lined boulevards and low-built mansions and houses. Start with monumental Ho Chi Minh Mausoleum which houses the embalmed body of the communist leader in a glass coffin. The marble edifice is impressive and tall with columns that hold the strong pediment. You can see the guards in unmistakably snowy-white military uniforms. Then the wooden stilt house where the president Ho Chi Minh resided in his later years. Ho Chi Minh himself, a spartan-living and scholarly man, chose not to live in the Presidential Palace; he preferred instead a simple teak stilt-house specially built for him in the grounds. Within the home you can see the modest lifestyle of the former leader, down to the bookshelf on the upper floor that holds his typewriter. Nearby you can see the One Pillar Pagoda, founded by fatherless King Ly Thai Tong in 1049 and Temple of Literature was Vietnam’s first university. Have time for the lunch break. 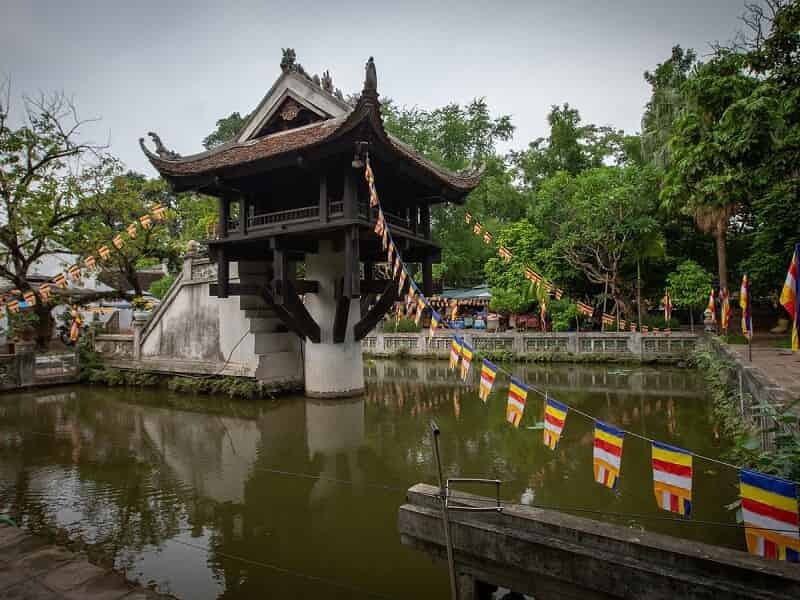 After lunch, follow your guide to the 6th century Tran Quoc Pagoda, Hanoi’s oldest Buddhist temple, originally built in the sixth century, and the Taoist Quan Thanh Temple. Stroll through the narrow alley then be immersed with a strong Vietnamese coffee at a café overlooking Hoan Kiem Lake (that appears on lonely planet Vietnam guidebook) - an important symbol of Vietnamese folklore - before heading to your final stop at Ngoc Son Temple on a tiny island on the lake. Enjoy a water puppet show for a look at traditional performance art in Vietnam before heading back to your hotel. Your northwest Vietnam Tour to discover the hidden hill tribes of Vietnam today takes you from Hanoi to Ba Be Lake via Thai Nguyen by road. The journey will take approximately eight hours and a half. En route visit the Thai Nguyen Museum of Ethnology to learn about the tribal people in the mountainous region of northern Vietnam. 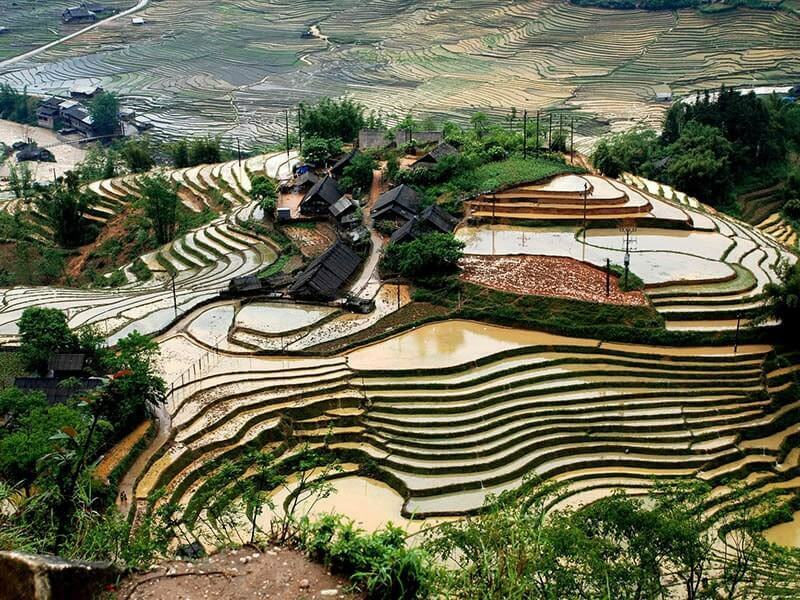 Watch the scenery change from urban city life to rice terraced mountains. Complete 105 km before arriving in Na Phac, enjoying stunning landscapes along the way. Halt for a late lunch in Cho Ra Town then head to Ba Be Lake. Spend the remainder of the afternoon exploring Ba Be National Park and Ba Be Lake on a local motorized cruise. Towards the end of the day, you will be transported to the village of the ethnic Tay people in Pac Ngoi. NOTE: Road transfer around 230 km, approximately 5 hours / Stop and sightseeing 1hour / Boat trip 3 hours. Overnight in Pac Ngoi Village. After breakfast, set off on a drive of 79 km towards Tinh Tuc. Upon reaching the destination, enjoy the stunning scenery of Phia Oắc or Colia Pass and take a short leisurely walk to visit a village of the ethnic Dzao Tien before having a coffee break. Head to Bao Lac for an hour walk around the village of the San Chay ethnic people, followed by a lunch break in Bao Lac. After lunch, proceed to drive along the picturesque Gam River up steep mountain grades for 21km to Ly Bon. During the drive, discover the remote lands between Cao Bang to MEO VAC. Take an hour walk through the fascinating valley of Niem Son and discover the cultural life of Nung ethnic people. Dinner then free at leisure at the hotel. NOTE: Road transfer 233 km. approximately 6 hours / Walking and sightseeing 3–4 hours. If the itinerary today coincides on Sunday, spend 2 hours in the morning to attend the weekend ethnic market of local tribal people in town. H’mong, Dzao and some Lo Lo hill tribe peoples come dressed in their best traditional costumes for market shopping and socialising. Return to Meo Vac and drive over the magnificent and spectacular Ma Pi Leng Pass. Stop to visit a village of the Hmong people where limestone rocks and fresh mountain water abound. 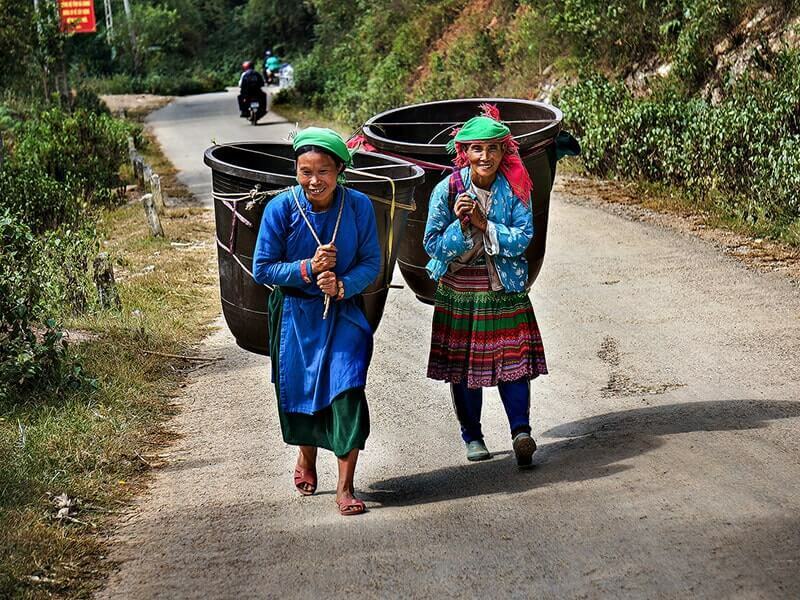 The journey about Vietnam tribes discovery ultimately arrives in DONG VAN, where you spend an hour, embarking on relaxed walk through this stunning valley. Explore the market and the ancient street of Dong Van before having time for lunch break. After rustic yet delicious lunch, follow the narrow road through the Ma Le and Lung Tao communes offering marvelous scenery of rocky plateaus. Pay a visit to a small village of the Hmong at Lung Tao before proceeding to Xa Phin valley. Learn about the historical palace of the Vuong family who ruled over the region, controlling opium production and trade until 1945. Conquer an hour’s drive, enjoy another walk is made to visit the Lung Cam Tren village of Hmong people. It is here where you get another highlight of the day as it is possible to meet the famous village chief who plays the Khen and performs traditional dances. Leave Lung Can behind and be transferred downhill to the Pho Cao pass for the lush Yen Minh Valley. Dinner at leisure. NOTE: Road transfer 85 km or 120 km if visit Lung Phin Market/ Walking and sightseeing 3 to 4 hours. Travel between Yen Minh and Hoang Su Phi today which takes you over the high mountain passes and through twisting valleys. Leave for Lung Tam while soaking up the beautifully stunning landscapes of the Yen Minh Pass. After a 2-hour and a half’s drive, reach commune of Lung Tam, set amidst beautiful natural surroundings and continue with a visit to a traditional workshop. The owner of the workshop Ms. Mai employs ethnic Hmong and Zao women, providing them with training about the traditional practice of weaving and embroidery as a means to a better life. Drive south over the breathtaking Quan Ba Pass, which offers picturesque scenery en route to another Hmong village. Arrive in Ha Giang city at noontime and stop for a lunch break. After lunch, walk to explore the peaceful and green Me village of Tay people, located around a large valley near Ha Giang (just about 6 kms from Ha Giang City). Located in the middle of green rice field, the village had been very well planned and built with great traditional house on stilts. Wandering along the path in the village, interact with local hill tribes or experience well-planned and built traditional house on stilts in their village will be a highlight of your day. Enjoy a scenic transfer of 110 km to HOANG SU PHI. Compared to the rocky land of Meo Vac, Dong Van and Yen Minh, the Hoang Su Phi area features very different scenery. 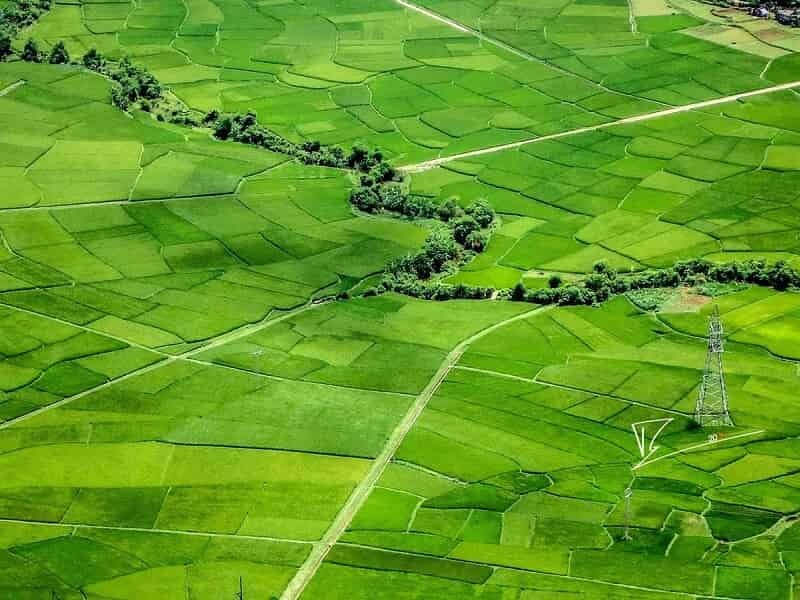 Lying on the top of the Chay River Massif, this district is embraced by lush, green forest, tea farms and possess the most impressive terraced rice fields in Vietnam. The road winds its way on high mountain sides and offers beautiful landscapes. Arrive at the Pan Hou Lodge in the late afternoon. After checking in and relaxing, enjoy a dinner on site. NOTE: Road transfer 210 km, approximately 5 hours / Walking and sightseeing 4 hours. Overnight in Hoang Su Phi. If the itinerary today coincides on Sunday, spend 2 hours in the morning to join the local weekend ethnic market of Flower Hmong, Red Dzao, Nung and Tay people, which is famous for its cattle exchange on the banks of the Chay River. Afterward, depart Hoang Su Phi for the 120km excursion along Chinese border through the Chay River Massif exploring the local life of the Flower Hmong, Tay and Nung. 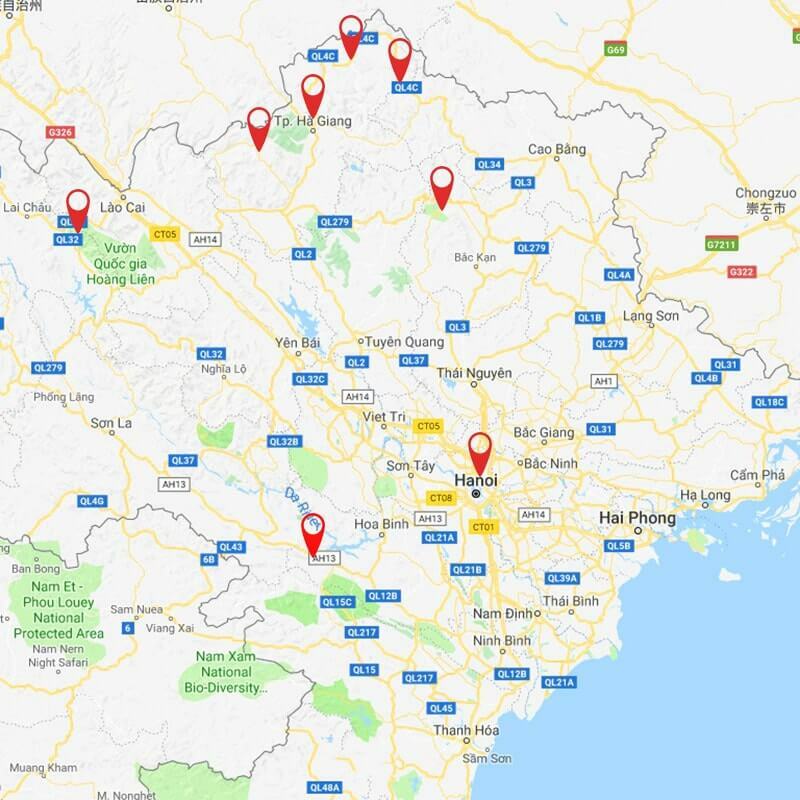 Spend approximately 2 hours walking through Lung Cai commune which is beautifully situated on a high mountain range, overlooking a narrow, steep valley where the Chay River winds its way between Vietnam and China. Reach Bac Ha Town at noontime, discover beautiful Hoang A Tuong Castle before having time for lunch break. Following lunch, spend the afternoon exploring the mighty Ban Pho Valley with the local guide. NOTE: Road transfer 120 km, approximately 3.5 hours / Walking and sightseeing 4 hours. Take an excursion to the local colourful ethnic market (including Ban Cam on Tuesday; Cao Son on Wednesday; Lung Khau Nhin on Thursday; Can Cau on Saturday; Bac Ha on Sunday). These local markets offer a variety of local products, such as an interesting animal market where pot-bellied pigs, cows and buffalos can be seen. The markets are only held on the above mentioned days only. After lunch, drive another 2 hours downhill to LAO CAI then 1 hour transfer by road up through the mountains to the former hill station town of Sapa, a base for tourists visiting the mountainous northwest. In the terraced hills and mountains of this area, the expansive green landscape is enlivened by the vibrant colors donned by its hill tribe populations. You can see the towering peak of Fansipan that reaches over 10,300 feet above sea level. Sapa was once a significant town for French military troops and missionary groups. Continue on a walking tour of SAPA for a visit to another busy market area, where the Red Dzao, Black H’Mong, Tay, and other ethnic minority people converge from the surrounding countryside to sell their silverware and handicrafts, and to buy provisions. Following this, take a light trek to discover Sapa's quaint hill tribe villages set against the stunning Hoang Lien Son Mountain Range and Indochina's highest peak, Mt. Fansipan. Enjoy the rest of the afternoon and evening at leisure. Appropriate footwear must be worn on treks in Sapa. Note that if conditions are wet, programs may be adjusted. After delicious breakfast, set off for a 30-minute road transfer to Ban Khoang Valley. Enjoy the fascinating view of Hoang Lien Mountain Range along the way, also former known as The Tonkinese Alps. Make the first stop of the day at Lu Khau Village in Ban Khoang Valley, where you could see colourful Blue Hmong and Red Dzao minorities. Walk to explore the village, then interact with the friendly local people and learn about their colorful culture and lifestyle in the countryside. Leave Ban Khoang Valley behind, then continue a 8-km road transfer to Ta Giang Phinh Valley where the lunch break is had. This afternoon, explore on foot through the charming Ta Giang Phinh Valley. Walk on the village path which winds down the impressive valley, home to Blue Hmong ethnic minority people. Visit some local houses to see some handicrafts workshops, observe villagers working in the fields tending their crops with buffalos. Return to Sapa town in the late afternoon. The rest of the day is free at leisure. Option 1: Early this morning, embark on a leisurely half day trek with the guide to Hang Da and Sau Chua Villages. Just about 8km east of Sapa, it is here that the Black Hmong peoples continue living their traditional, unique way of life despite the recent changes and tourism boom in Sapa town. Walk with the guide along the quiet narrow pathways through the countryside along the scattered, modest houses of the Black H’mong people. The trekking route can be adjusted depending on energy levels, fitness, and weather conditions. Option 2: After breakfast at the hotel, depart on a scenic drive to the stunning and remote Sang Ma Sao Valley where offers the unique opportunity to explore the beautiful area and authentic village on foot. Meet the White Hmong people in their homes, see how they live and how they work at the fields with the buffalos. Enjoy a rustic, yet delicious lunch at a local house before heading back to Sapa town. Arrive back at the hotel to checkout by 12 noon. Spend time visiting the town and having lunch, and enjoying a few last minute explorations. In the late afternoon, be transfer back to Hanoi by private bus. Arrive in Hanoi late in the evening; the rest of the day is free at leisure. Set off in this morning for the drive to MAI CHAU (approximately 4.5 hours). After just an hour of driving, the road opens up to mountains, fertile valleys, and traditional villages. Reach the beautifully picturesque Mai Chau Valley surrounded by spectacular karst rock formations and rice paddies then have time for lunch break. After lunch, spend the afternoon exploring the idyllic natural surroundings and visit the extraordinary Mo Luong (Soldier) Cave. Return to hotel then free at leisure or own exploration around the town. In the evening, be immersed into a traditional Thai performance of music and dance. 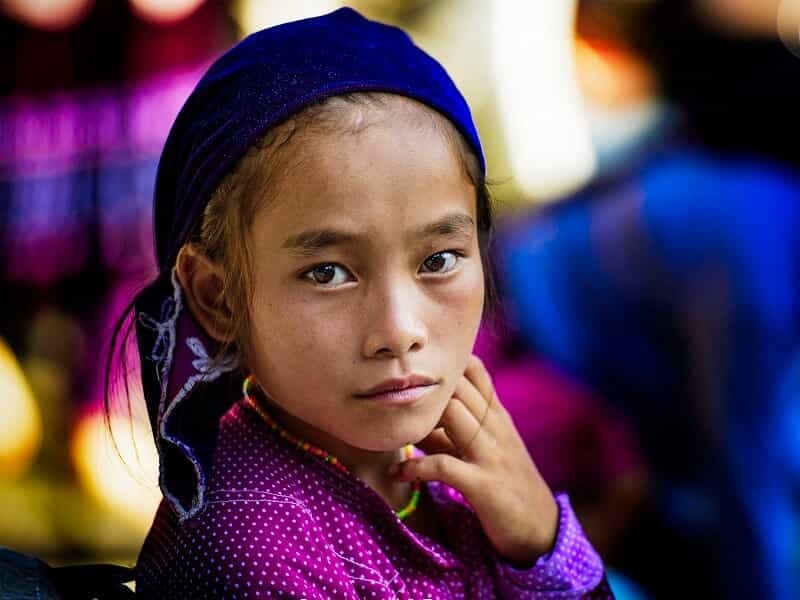 The Thai ethnic group has inhabited this area for centuries and much of their lifestyle and traditions have remained unchanged over the years. Stay overnight will be made in a traditional stilt-house of the Thai people, an incredibly enriching experience and the perfect way to soak up this fascinating culture first hand. This homestay accommodation consists of comfortable, curtained-off sleeping areas in one long room; all bedding and mosquito nets are provided. NOTE: If itinerary to Mai Chau town coincides on a Sunday, then a visit to the weekly market in the village of Xa Linh is recommended. Your adventure to explore the Northwest Vietnam’s hidden tribes wraps up today. Begin the morning with a leisurely light trek (2- 4 hours) through surrounding villages in the Mai Chau Valley, passing the tranquil rice terraced field. Have lunch at the local homestay or restaurant. After lunch in Mai Chau, begin the journey back to Hanoi. Along the way, be sure to have the camera ready upon reaching the top of the Mai Chau Valley. The views are superb! Reach Hanoi late this afternoon. Laid back until your private transfer will ferry you to the airport where you will catch your return flight home. For ideas on further customization, you may want to listen to our further suggestion for your Vietnam trip.